The Binding of Isaac community lost their minds yesterday, in search of items missing from the game. Teases from designer Edmund McMillen suggested it was an elaborate, totally ridiculous mystery for players to solve. The reality is far more mundane: it was a joke, while the developer worked on a patch. If you missed yesterday’s story about how far The Binding of Isaac fans were going to figure out what was happening, here’s a prime example: they were reading passages from the Bible, suspecting it contained hints on what to do. The game’s latest expansion, Afterbirth, promised more than 120 new items for players to use. When the expansion launched, however, players could only account for 74 items. Worried they’d been ripped off, McMillen began teasing that players simply hadn’t looked hard enough, beginning a National Treasure-esque dive into The Binding of Isaac that had everyone putting on tinfoil hats. 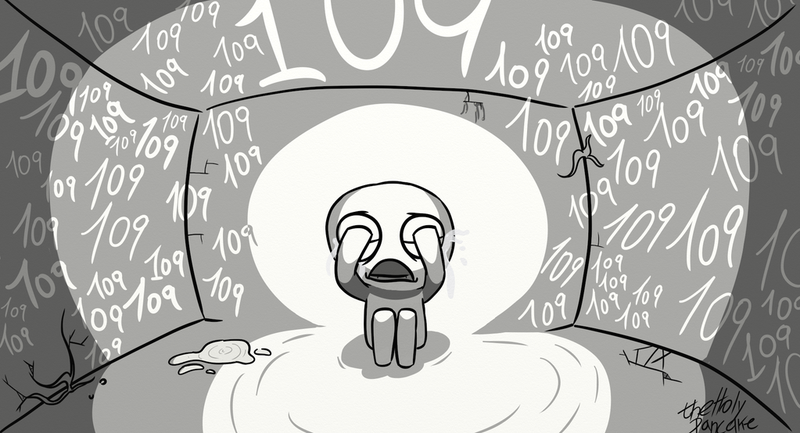 Specifically, lots of players were focused on the number 109, which has a history in The Binding of Isaac community, related to the number of hours it supposedly took for one of the game’s biggest secrets to be exposed, thanks to data mining. Roughly 109 hours after Afterbirth was released, a patch dropped for the game. Were there new mysteries to be solved? Would the path become clear? Nope. Instead, it was just a patch. The items should have been available at launch, but there was a glitch that prevented them from showing up. It was an elaborate ruse on the part of McMillen, a way of toying with the community. The move has not been met with universal acclaim, however, with some fans upset McMillen allowed fans to spend so much time and effort on something that ultimately amounted to nothing. He could have said a patch was coming. But in addressing what was going on, he left the door open to more speculation. Of course, it wouldn’t be shocking that Afterbirth would be hiding more secrets that people haven’t yet found—that’s been a mainstay for The Binding of Isaac. Gotta admit, I was loving how ridiculous this was getting. It’s disappointing there really isn’t an elaborate conspiracy going on. Maybe McMillen can actually work something like that into the next expansion for The Binding of Isaac?